Cielo is a red blend from some of our favorite varietals grown in Napa Valley. Each vintage, the blend is uniquely designed so that it may be termed “heavenly” as Cielo in Italian translates to heavens or sky. Problem free harvest that produced clean, healthy grapes resulting in high-quality wines despite the drought and a very small crop with a little uneven ripening. Picking ended in October. A dream vintage, with high quality throughout. Drought conditions and small crop size did prove to be minor irritants. Everything was ready to pick in mid-August. This "old world" style wine continues to please the most discerning palates. Cielo in Italian means heaven as we believe this wine is a heavanly blend. An ideal growing season with dry conditions and a long, sunny summer. Despite being a drought year it is worthy to be called superior. This food-friendly wine features aromas of blackberries, tarragon, white pepper and raspberries. Cielo has a birght finish to compliment your favorite foods. An ideal season with no frosts, a mild spring and summer and a tranquil fall. We are elated by the quality and quantity of the 2012 harvest. There is a level of excellence that supersedes past vintages, going back decades. This Sangiovese blend is approachable with bright plum-currant avors and hints of cedar on the palate. The Cabernet softens the spice ever so gently. A cold, wet spring, a late fruit set, a mild summer and a harvest that dragged on into November, bedeviled by rain. We were able to salvage the season by picking the entire vineyard in one day. This wine has aromas of black fruit, tarragon, white pepper black plum and mushroom. The texture is smooth, rustic and dusty with a bright finish. The growing season began cool and wet and delayed harvest drastically. A late August heat wave sent the temperatures from the mid-70s to 110. Careful observance was a must! Flavors of white pepper, dried cranberries and blackberries. This food pairs well with spicy foods, "gamey" meats and tomato based sauces. Things went fairly smoothly and grapes were picked at optimal ripening levels, capping a summer of mild, steady weather. We were excited about the young wine's color, flavor, acids and tannins. There is a brilliant nose of white pepper and soft spice while maintaining a balance of fruit. This year marks the first decade of Cielo production. Drought preceded a hard frost, which led to an uneven set and a small crop, but after that it was smooth sailing ending in great relief. 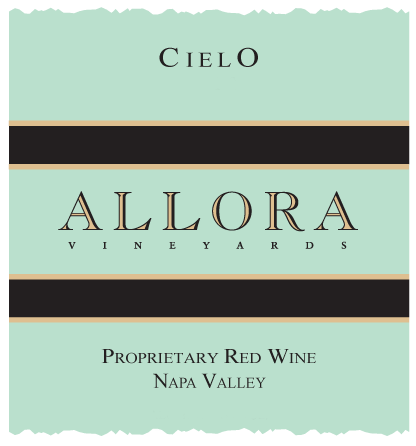 Cielo has bright acidity and compliments bold and spicy flavors. Sangiovese adds soft, peppery spice while the Cabernet brings a velvet texture. Cold winter grew into warmer spring bringing early budding, bloom and set in the vineyards. A heat spike boosted the sugar development that complemented the excellent acid structures. Beautiful aromas of cedar, black currants, tobacco leaf, and forest floor are followed by a spice, bright acidity, and a complex personality. One of the top vintages of the decade but not one where "the wines make themselves". A cool, wet spring led to slow ripening while heat spikes in July caused worry of sunburn resulting in an expensive farming year. Notes of strawberry jam, cedar, new saddle leather, and roasted herbs. The complex aromatics are accompanied pure fruit and plenty of character. Predictions abounded that it could be one of Napa's finest vintages. Cool weather prevailed and harvest came very late but was nearly perfect. Extended hang time allowed for great flavor and bountiful harvest. Dominant notes of strawberries and potpourri, the wine is vibrant with a medium to full body, satisfying flavors of tart cherries and an elegant finish. Short and sweet summarizes the 2004 vintage. The harvest was early, the crop was small and the grapes ripened well. A gorgeous perfume of dried rose and cinnamon still wonderfully well-balanced. It is very feminine, showing gorgeous baking spices, and a long finish. A cool spring brought a mild summer with only one heat spike in the first part of July. Fruit ripened under conditions that allowed a long hang-time concentrating flavors with a strong backbone of acid and clean fruit. Innagural vinatge made with fruit from Howell Mountain and Stags Leap. The Cabernet Franc adds a subtle elegance and silkiness to the soft spice.